The included photo of Bernard (Bernat) Feldinger was also used to complete the "Give them a Face" portrait collection (KD_00017) and the commemoration wall at the Kazerne Dossin museum. Jozef Feldinger was born in Nizni Verecky, Czechoslovakia, on 2 September 1877. He became an assistant at the synagogue and married Dora Katz (b. 1882 in Nizni Verecky, Czechoslovakia). Together they had five children : Etel Feldinger-ova (b. 12/12/1901 in Keretsky, Czechoslovakia, now Ukraine), Manusz Katz (b. 03/11/1906 in Svalava, Czechoslovakia, now Ukraine), Moses Chaim Katz (b. 11/05/1911 in Svalava, Czechoslovakia, now Ukraine), Rosa Malvina Katz (b. 16/02/1913 in Svalava, Czechoslovakia, now Ukraine) and Bertha or Malka Katz. The fate of Bertha remains unknown. There are no records proving her presence in Belgium during the war. After Dora Katz had passed away on an unknown date between 1913 and 1924, Jozef religiously married Dina Meisels-ova (b. 10/10/1890 in Keretsky, Czechoslovakia, now Ukraine), with whom he had three more children : Benjamin Feldinger (b. 11/11/1924 in Keretsky, Czechoslovakia, now Ukraine), Dora Feldinger (b. 19/11/1926 in Keretsky, Czechoslovakia, now Ukraine) and Bernard (Bernat) Feldinger (b. 12/12/1928 in Keretsky, Czechoslovakia, now Ukraine). In 1931, Jozef Feldinger emigrated from Keretsky, Czechoslovakia, now Ukraine, to Belgium, where he was reunited with his oldest son Manusz whom had emigrated the year before. 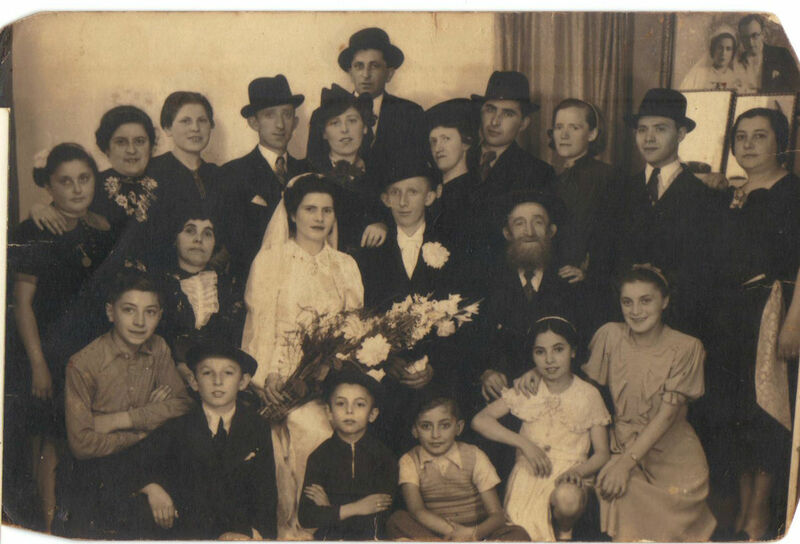 Rosa Malvina Katz followed her father and brother in 1932, Benjamin, Dora and Bernard Feldinger with their mother Dina in 1933, and Etel Feldinger-ova and Mozes Chaim Katz in 1934. The complete Feldinger family settled in Antwerp, where Benjamin and Bernard attended the religious Jesode Hatora school. Jozef Feldinger passed away in Antwerp on 12 April 1942, a few months before the start of the deportations from the Dossin barracks. Most family members were deported from the SS-Sammellager to Auschwitz-Birkenau and perished. Dora Feldinger presented herself voluntarily at the Dossin barracks on 27 August 1942. She did not survive deportation via Transport VII on 1st September 1942. Mozes Chaim Katz perished after deportation from the Dossin barracks via transport IX to Auschwitz-Birkenau on 12 September 1942, although he was initially selected as a forced labourer (tattoo number 177679). The women and children in the Feldinger family were all arrested during the fourth, big anti-Jewish raid in Antwerp (22, 23 and 24 September 1942) : Rosa Malvina Katz, Bernat Feldinger, Dina Meisels-ova, Etel Feldinger-Ova, Leo Feldinger (son of Etel Feldinger-Ova), Laura Kleinbart (wife of Manusz Katz) and Harry Katz (son of Manusz Katz) perished after deportation via transport XI on 26 September 1942. Organisation Todt worker Manusz Katz perished after deportation from France and the Dossin barracks via transport XVI on 31 October 1942. Benjamin Feldinger was the only family member that survived deportation. He presented himself, together with his sister Dora, voluntarily at the Dossin barracks on 27 August 1942. They had received a convocation for forced labour (Arbeitseinsatzbefehl). Transport VII left Mechelen on 1st September 1942 and arrived at Auschwitz-Birkenau on 3 September 1942. Benjamin was hurdled out of the train in Kosel, the number 160019 was tattooed on his arm. He survived the mines of labour camp Dora and the death marches to Buchenwald and Ohrdruf in January 1945. Benjamin Feldinger was liberated by the Russian army at Theresienstadt in May 1945 and was repatriated to Belgium on 13 July 1945, where he was reunited with his sister-in-law Golda Dychtwald (wife of Mozes Chaim Katz) and his niece Astrid (Dori) Katz. Benjamin emigrated to Israel, had children and grandchildren. Yosi Feldinger, son of Benjamin Feldinger, and Neely Feldinger, daughter of Yosi Feldinger, sent Kazerne Dossin copies of their families photos in 2014.